Picled Tomatoes and Dill Cucumbers are excellent marinated tomatoes with cucumbers and herbs. A wonderful snack. 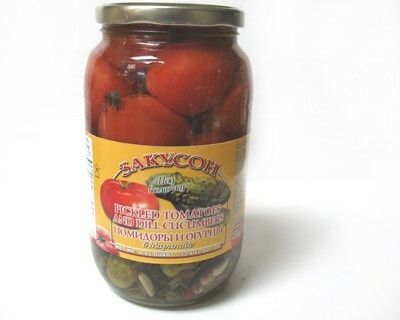 Open a jar of our Pickled Tomatoes and you will quickly realize that you can`t eat just one! They are made without boiling-water bath and are immersed in salted water with herbs and spices. That`s why our Pickled Tomatoes remain crispy, firm and tantalizingly prickly to your taste buds.